One of my favorite things about this season is picking out the perfect gifts for loved ones. Of course, I love it all so much I want to buy two of each so I can have it too.😉 I was browsing Target’s holiday ideas when I came across these gems. Target strikes again!! I have some of these items on my own wish list and there were way too many to even collect it all here. These were my favorites from Target to share today though! The Marc Jacobs perfume is usually $75 marked down to $50!!! Daisy is one of my favorites! What a steal?!! Perfect for the beauty lover (or you!). Now as for the house items, I’m obsessed with furry pillows and blankets. They are just the best in winter. The gold silverware set is amazing! I want to use them year round. That vanity…come to momma!! 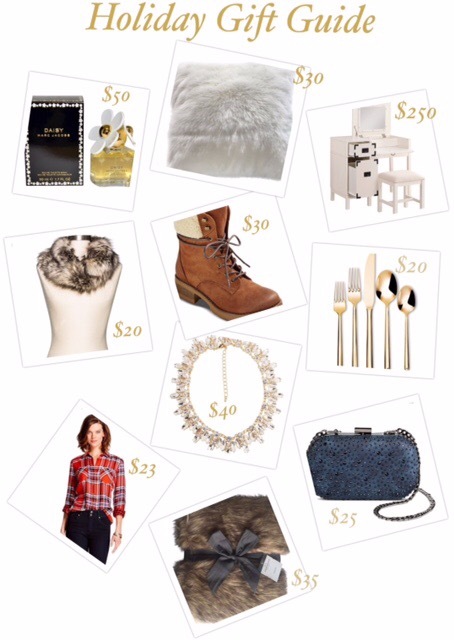 Now I love to blend my down to earth plaid and boots with a little jazzier pieces like the statement necklace or faux fur scarf. The clutch is perfect for all the upcoming holiday parties too. I love daisy by marc jacobs ! Yes!! Gotta love this time of year when there’s awesome deals on it too!